More and more companies are finding ways to incorporate technology into their events to create a more cohesive experience. Live message boards, photo walls, and other high tech features help people engage with one another and with your company’s mission. A significant change in the event planning industry is a new appreciation and focus on local gems. Instead of going to the biggest ballroom in town, many people prefer to host events in private spaces that have more of a modern feel or a unique, artsy appeal. Sterling Catering can work with your venue to achieve a one of a kind experience. Everyone is talking about what we eat, how we eat it, and the implications of our menu choices. 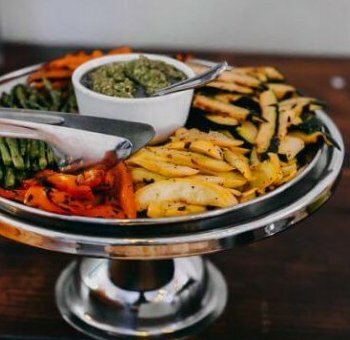 As a result, companies like Sterling Catering are offering a more extensive range of menu options to include vegan, gluten-free, and other specialty diets. Event planners who incorporate these choices in their menus are earning plenty of praise. Formal dining appears to be on the backburner, as more people are focused on enjoying one another’s company in an unstructured environment. Small plates and shareable dishes make it easy for people to move around and mingle as they see fit. As we grow more aware of the world surrounding us, many event planners are capitalizing on their events by using the time and space to bring attention to worthy causes. In the case of businesses, this may be reaffirming your company mission statement, but schools and other organizations are raising funds and shedding light on social justice issues as well. Expect to see more educational moments at events this year. Sterling Catering & Events handles over 100 events every year including weddings and social events. To learn more about trends in the event planning industry, you can speak to one of our catering experts today. Our team is happy to help you coordinate the perfect event with delicious customized menus, beverage service, and an excellent venue for all your guests. No matter what kind of event you are throwing, we are always on top of all the latest event trends.